The historic Fiat plant in Rivalta, near Turin in Italy, is set to become one of Mopar’s global parts distribution centres serving Europe, the Middle East, Africa (EMEA). With the rapid global expansion of Mopar (the service, parts and customer-care brand for FCA vehicles), this project will transform a former vehicle production plant into an innovative, energy-efficient and environmentally-sustainable parts and accessories storage and distribution warehouse. The new facility will support over 5,000 facilities, improving delivery time to retailers and workshops, increasing customer service quality as a result. “As we grow the Mopar brand around the world, customer satisfaction continues to be one of our key global priorities,” said Pietro Gorlier, Global Head of Parts and Service (Mopar) and Chief Operating Officer of the EMEA region. 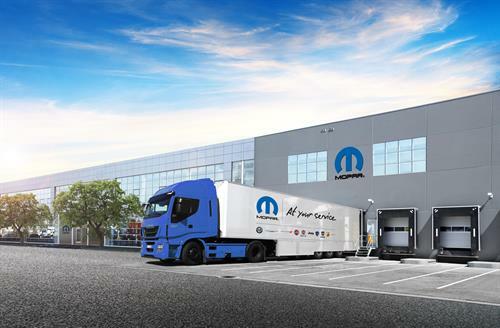 The Mopar brand continues to invest to meet an increasing global demand that saw over 47,000 tons of parts and accessories distributed in the past 12 months, supporting more than 7,000 retailers and workshops throughout the EMEA region alone. In Europe, the brand offers a portfolio of more than 260,000 accessories and parts, while globally it operates in more than 160 markets, with more than 50 parts distribution centres located in over 20 countries. The Rivalta project is set to optimise Mopar’s global operation, with approximately 340,000 square metres of space, of which 40,000 square metres will consist of new buildings. The storage and dispatch area will be strategically located to allow easy access to transport links, ensuring significant advantages in terms of parts handling and logistics. By 2020, the new structure will also host the regional headquarters of Mopar. The project will implement energy-efficient and environmentally-sustainable features, including use of solar panels, fitting rainwater recovery systems and use of eco-friendly materials, in all cases carefully assessing resource life cycles from production to disposal. From inception, the facility was designed to achieve the highest level in “World Class Logistics,” a prestigious world certification programme. Mopar was awarded Silver level certification for their facility in 2017 and is the only brand in the region to have achieved this recognition. The Rivalta plant started operation in 1967 and produced many of Fiat’s most popular models such as the Fiat 124 Spider, Dino, Ritmo and Bravo. Mopar was launched in August 1937 and derives its name from the words “MOtor PARts”. Since then, Mopar has grown to encompass total service, parts and customer care for FCA vehicle owners around the globe.